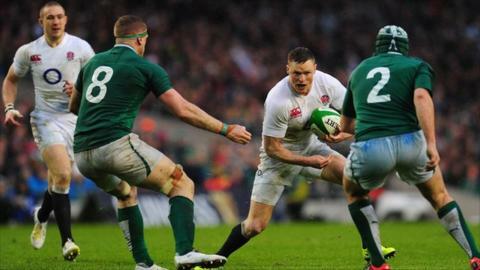 England's young team won a famous victory in testing conditions to end a 10-year Six Nations hoodoo in Dublin. Four penalties from the boot of Owen Farrell saw them hold off a fierce Irish onslaught and move top of the championship table in what was the lowest-scoring match since the Five Nations became the Six Nations in 2000. On a miserable, wet day it was seldom pretty, and when James Haskell was sin-binned with a quarter of the game left, Ronan O'Gara's second penalty saw Ireland level at 6-6. The hosts looked set to take control, but with skipper Chris Robshaw leading from the front, the 14 men instead first stood firm and re-established their lead thanks to Farrell's accuracy. Farrell's penalty on three minutes gave England the lead, with handling errors costing both sides promising positions. Ireland lost sparkling winger Simon Zebo to injury but saw his replacement, Keith Earls, make inroads with a scything run before each team reverted to kicking for territory. The latent passions boiled over when Cian Healy stamped on Dan Cole's ankle at a ruck, triggering a melee of grabbing and shoving, while Farrell was lucky not to be sin-binned for dragging back his man without the ball. It took a typically sweet pass from Brian O'Driscoll to set Earls clear again, only for another knock-on - this time from Mike McCarthy - to toss away the momentum. Farrell made it 6-0 with unerring accuracy just before the half-hour, and Ireland's problems mounted when playmaker Jonny Sexton limped off after appearing to injure his hamstring. The home side's travails were summed up by skipper Jamie Heaslip twice spilling regulation high balls, but within four minutes of the restart Ireland had a lifeline. Referee Jerome Garces penalised England for collapsing the scrum and O'Gara stroked over his kick. For the first time the men in white looked rattled. Tom Youngs's line-out throw twice went wayward; with Lancaster responding by sending on Manu Tuilagi and Courtney Lawes for Billy Twelvetrees and Joe Launchbury, and then Dylan Hartley for Tom Youngs. As the rain continued to sweep in, the game appeared to turn just before the hour. Haskell was sin-binned for interfering on the wrong side of a ruck, O'Gara drilled over the penalty, and the sides were level. Yellow cards had hurt England in their last two Six Nations clashes in the city but this young side had other ideas. A cute kick through from Farrell sent Rob Kearney scampering back and, from the resulting line-out, Ben Youngs almost put Tuilagi under the posts with a chip, only for the ball to bounce away from the centre's grasp. To the crowd's dismay, referee Garces had already spotted Irish hands in the ruck and Farrell stroked over his third successful penalty. He then made it 12-6 when Kearney was pinged for holding on. With the minutes ticking away and nerves tightening, O'Gara had a chance to cut the lead but pushed his penalty wide, while Alex Goode was impeccable under Ireland's high kicks. Farrell narrowly missed from wide on the right after O'Gara was again pressurised into an error but Ireland had nothing left, and England were able to run the clock down to secure their first Championship win in Dublin since 2003. Ireland: Kearney; Gilroy, O'Driscoll, D'Arcy, Zebo; Sexton, Murray; Healy, Best, Ross, McCarthy, Ryan, O'Mahony, O'Brien, Heaslip. Replacements: Earls for Zebo (10), O'Gara for Sexton (31), S Cronin for Best (74), Kilcoyne for Healy (74), Fitzpatrick for Ross (78), Henry for O'Brien (66), O'Callaghan for Ryan (65). England: Goode; Ashton, Barritt, Twelvetrees, Brown; Farrell, B Youngs, Marler, T Youngs, Cole, Launchbury, Parling, Haskell, Robshaw, Wood, Lawes. Replacements: Tuilagi for Twelvetrees (47), Hartley for T. Youngs (50), Wilson for Cole (76), Lawes for Launchbury (47), Waldrom for Lawes (71). Not Used: Vunipola, Care, Flood.